You've stopped by on a great day because this is one of the stops along Lori Whitlock's blog hop! There's a giveaway on every stop, so be sure that if you are starting here, go back to Lori's site and start from the beginning! The paper is from the Echo Park Here & Now collection, also designed by Lori! 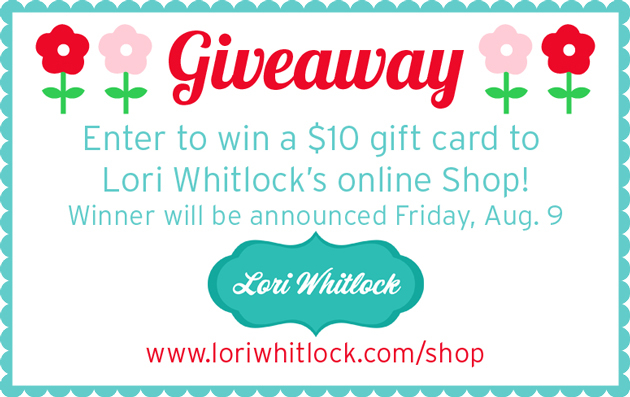 Now before you hop over to the next design team member's site, be sure to follow these steps to be eligible for my giveaway -- a $10 gift card to Lori's online shop! Leave a comment below telling me that you've done these things to win! my facebook page and here on the blog! I've done all of the requirements listed above and I absolutely love ur hot air balloon card!! Your projects are fantastic and can see I'm not the only one who loves the Here and Now collection!! I love hot air balloons and it looks so good with the different coloured and patterns layered for the balloon itself. And I so want the notepad, the triangles are awesome!! Oh, and I've also done all your requirements for the giveaway. Thanks for the inspirations. Huge fan of Lori and her products so was pleased to add your FB to my likes. :) I LOVE the card, fabulous paper choices. Thank you Tabbatha -- you are so sweet! Thanks for liking my FB page -- good luck with the giveaway! Thank you for inspiring me! You've made really great projects. That note card holder makes a perfect gift! (And of course I did all the required steps). So glad you stopped by! Thank you for your sweet comment and good luck with the giveaway! for a while and glad to add you to my FB likes! I love the pen holder note pad. Just wish it was in the SStore. But may have to buy it ne way. Love your work and thank you for sharing. Love the paper you used. The pink just pops out at me on the card. Love that. I already like you both on Facebook and have been following Lori's blog for a little while now. thanks for the chance to win. Hey Wendy -- thanks for visiting! I agree with you about the paper -- love it!! Thanks for following Lori and Artsy Albums! I really like how you used these files- very pretty! I'm already following Lori on FB, her blog, and by email, but just added you to FB too. Thanks so much for the chance to win! I love your projects...so pretty! I love both of your projects! I have seen that hot air balloon card and I love it! I have done all of the giveaway requirements as well. Thanks Beth!! So glad you are a new friend to Artsy Albums!! I do giveaways often so hope you'll check back in again soon. I love your projects. I have been following Lori on FB, her blog and you on Facebook :-). Thank you for the opportunity! Awesome Suz So glad you are here and a new friend to Artsy Albums on FB!! Good luck with the giveaway! Finished the requirements. Thanks for the chance to win! Thank YOU Leslie! I hope you'll come back to Artsy Albums often :) Good luck with the giveaway ! Great projects, I just started following your Facebook page. Awesome projects!! I love them!! Thanks for the chance to win, I did all the requirements also. Hi Jeana -- thank you so much! 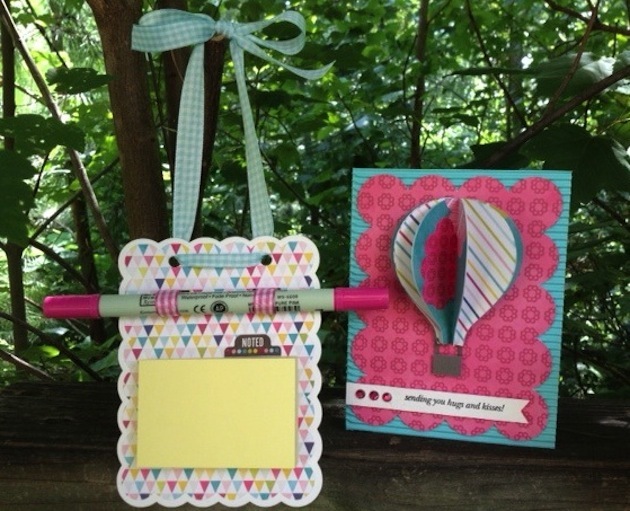 Lori's note holder is really fun to make...and easy! So glad you are a new Artsy Albums fan! Welcome! Love your card!!!! I'm new FB fan! Thank you Ruthie! I'm excited that you're a new Artsy Albums fan!! Welcome...and good luck on the giveaway! Awesome projects. You are very creative. Thanks for the chance to win, I finished all of the requirements. Awesome Renee -- thank you!! So glad you stopped by and hope the blog hop is getting your creative juices flowing :) Good luck with the giveaway! I just liked your page on Facebook. I was already a fan of Lori's page and blog. Welcome to Artsy Albums jenleon! I'm so glad you stopped by and became a friend on Facebook!! All the best...and good luck! I'm already a follower of Lori's blog and have already "liked" your Facebook page as well as Lori's. Thanks for the giveaway. I have completed all that is required. Like your facebook, and I have been with Lori's Facebook and blog for some time. I want to say I had looked at Lori's post it note holder. Seeing a close up what a great little gift for office workers and of course others. Oh yes!! The note holder would be a great little gift!! Love that idea! Thanks for visiting Artsy Albums! I like Lori's FB page, follow her blog, and like you on FB! I first noticed your post it note pad. That is on my list of things to do! 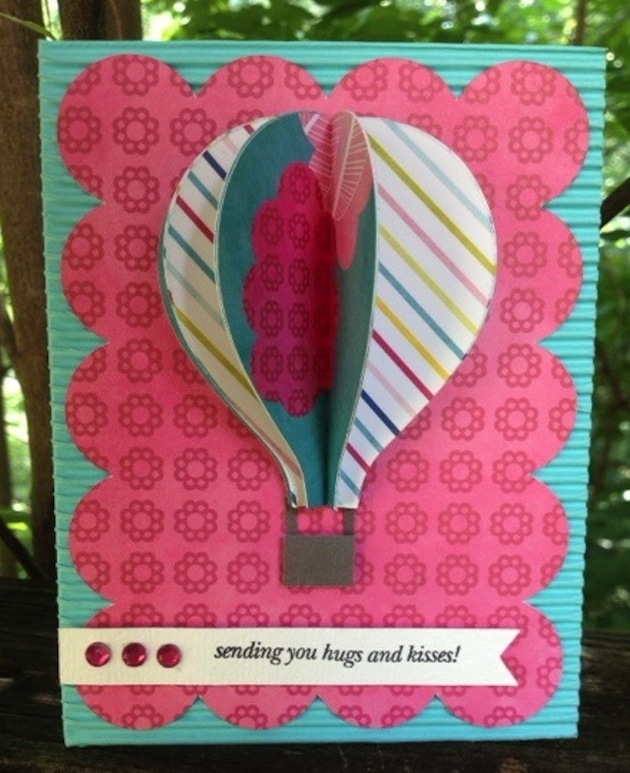 And your hot air balloon card is simply cute! Love it! Glad you stopped by and thanks so much for liking Artsy Albums on Facebook! Great -- thanks SO much Jill! Hope you had fun on the blog hop -- so glad you hopped over to Artsy Albums! Thanks so much Debbie! Making mini album kits is such fun for me so I am glad you like the albums!! Thanks for stopping by! Like your FB page, Like Lori's FB page, Following your blog and follow Lori's blog. Your projects are super cute, thanks for sharing. Thanks so much Beth! I'm so glad you stopped by Artsy Albums -- good luck with the giveaway! I have liked all three! Thank you for the chance to win! Hey Pam! Thanks for visiting Artsy Albums ! hope you enjoyed the blog hop and all of the inspiration along the way!! This is a first time for me. Love Lori's blog and now following it - added to believe it designs. Hey Lori! Welcome to the blog hop! Lori Whitlock's site is awesome -- you will always find wonderful inspiration there :) So glad you stopped by! These are wonderful. 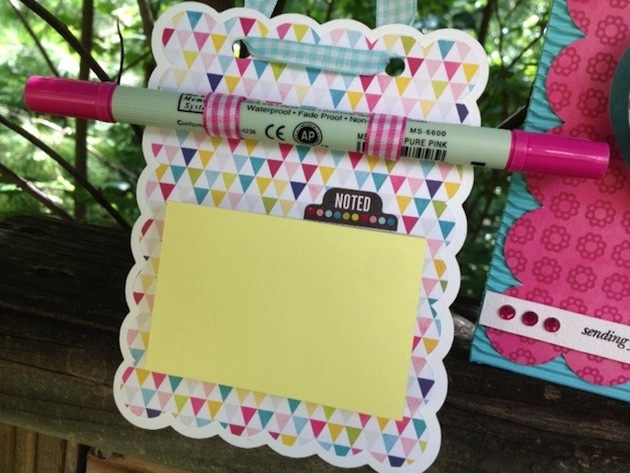 I love the sticky note pad project! TFS. Hi D! Glad you stopped by to visit again! Hope you enjoyed the blog hop and good luck with the giveaway! That notepad holder is great. I'm going to be making one for my daughter's locker at school! I've been a long time Lori fan! Thanks for the inspiration! Thanks Brandy! I love Lori's notepad holder too! It will be perfect for your daughter's locker -- love that idea! I 'liked' your facebook page and had already followed Lori's blog & liked her facebook page. This is great. I'm getting so many ideas and a whole lot of inspiration. Both of your projects are going on my "to do" list. They're great! Great Stephanie! So glad you like my projects -- Lori's designs are always awesome :) Thank you for stopping by Artsy Albums -- good luck with the giveaway! Thanks Jean! Good to see you at Artsy Albums again! Good luck with the giveaway! I LOVE the notepad holder, so adorable. I liked your FB page and I already follow Lori. I liked your facebook page. I already follow Lori's blog & liked her facebook page. I'm a good girl, I did all these things. Fantastic projects Traci, love them!! Thanks Brigit -- loved your adorable box and card too! Thanks so much NormaJean! and thank you for visiting Artsy Albums! Very cute projects! I am not on Facebook but I do follow Lori's blog. No problem Sue -- you can follow my blog instead of FB to stay up-to-date on all the Artsy Albums happenings :) I'm so glad you stopped by! Did all of the above. Always love looking at all of your beautiful creations! Thanks Bonnie -- you're sweet! Good luck on the giveaway! ive done all 3! thanks! Hi Alana! Thanks for being a new friend of Artsy Albums -- I'm so glad you stopped by! Hope you enjoyed the blog hop :) and good luck with the giveaway! Ha ha ha -- you've got it covered :) So glad you stopped by !! Thank you! I love all things 3D so the card popped for me. Thanks to you and Lori for the inspiration and opportunity to win! You are so welcome Barbara...and thank YOU for visiting Artsy Albums! Please stop by again soon! Seeing as you'll now show up in my FB feed (I 'liked' your page, and not just because I had to 'like' to win... :P ), I'm sure you'll see me here again. Excellent -- I popped over to your site as well -- lovely projects!! I like Artsy Albums and Lori Whitlock on FB, as well as follow Lori's blog. Thanks for the opportunity.